Department of KH composite cement foaming agent is developed by our company the most new generation of concrete additives. Through molecular structure design and material selection formula and the development process of orthogonal test of a new generation of KH high efficiency foaming agent. Professional for the production of foam concrete block, lightweight partition board, mine tunnel backfill. The foam has high reliability, independent small closed pollution-free, its performance is neutral, soluble in water, foaming at room temperature. 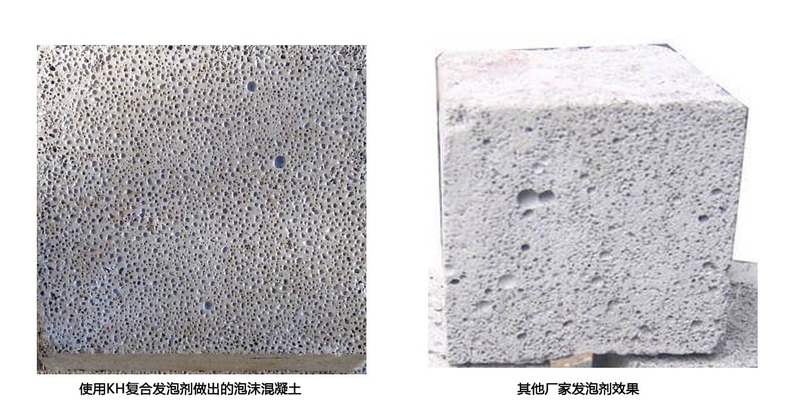 Can produce a lot of bubbles in the cement paste, bubble is independent and uniformly distributed in the cement paste, the formation of a large number of closed pores. A barrel of foaming agent (200kg) can produce about 500 cubic meters of foaming cement. The use of non-polluting import materials and plant and animal protein, regardless of any side effect to the producers and users and the environment are not. 5. High ratio of performance to price. KH composite foaming agent is mainly used in the non-autoclaved aerated concrete block wall, production. It may be cement, magnesia, lime, gypsum, limestone powder, sawdust, fly ash, sand, paper sludge and other raw materials, foam, made of foam concrete block, wall panels, panels, hollow brick, solid brick, heat pipe protection cover, roof insulation foam board and other lightweight building materials, can also be used for the roof, floor heating, indoor noise insulation cushion production.